Goodbody says that it’s about a third of official figures. Construction is being focused in the greater Dublin area. A TRACKER THAT measures the number of new houses being built in the State has suggested that the actual number is well below official figures. The tracker is from financial firm Goodbody and bases its figures on the number of Building Energy Rating (BER) certificates registered over a particular period. Figures from the Department of Housing rely on the number of connections to the electricity grid but Goodbody argues that these may not be accurate. It says this may have been exacerbated by unfinished houses from the financial crisis that have since been reconnected to the grid. Using its methodology, Goodbody estimates that there were 5,377 houses completed in 2016, just over a third of the official figure of 14,932. 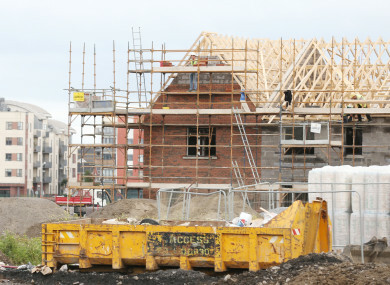 The Goodbody stats do show that the rate of house building in Ireland has begun to grow rapidly over the past 18 months. In the year to August, 7,719 houses were completed according to the research a 77% jump on the previous 12 month period. The tracker also records that while the pace of construction has increased across all regions, 72% of the new homes completed were in Dublin or its three neighbouring counties. In terms of the type of homes completed, Goodbody says that semi-detached homes made up 41% of the newly completed homes with apartments making up just 15% of the new builds. Email “A construction tracker claims the actual number of houses being built is fewer than officials claim”. Feedback on “A construction tracker claims the actual number of houses being built is fewer than officials claim”.